The Enhanced RPG Kit is available as optional DLC. This page explains some of the core functionality present inside this template. 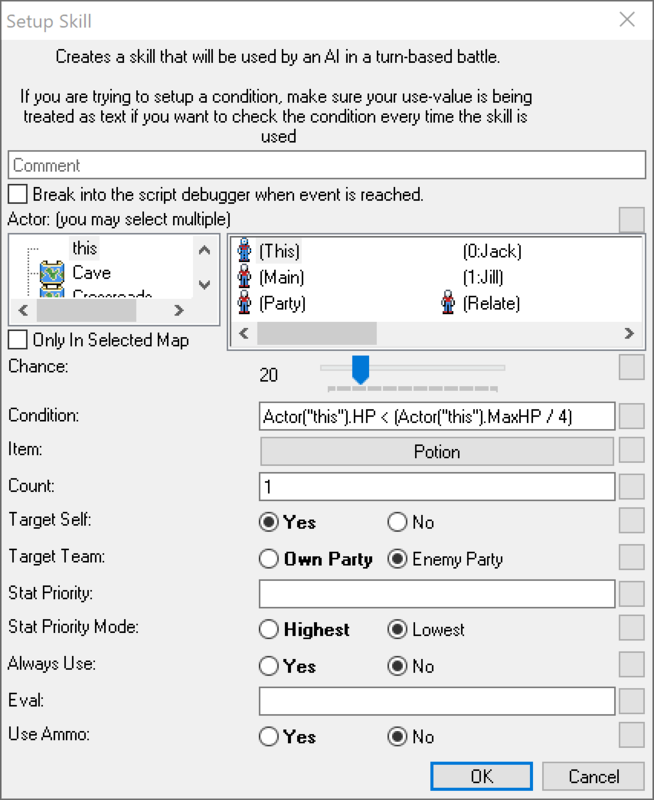 To setup the enemy/ally AI, you can place the various AI setup events in the actors template loaded trigger. An alternative is to directly place the AI events after the “Add Enemy” or “Add Ally” events, then using the use-value “Custom.Last_Spawned_Actor” to get the scripting ID of the last created enemy/ally. You can also use the “Custom.Last_Spawned_Actor” use-value to modify an actors health, stats, etc. Please read the documentation related to turn-based AI and using the events to learn more. By default, an actor will simply spam its “Normal Attack” which will use its equipped item, or a “Generic Attack” item which does not enhance stats. Each parameter set by any of the AI events (Minus the actor option) are treated as text script when a value is inputted. What this means is whatever is put into the fields must be handled carefully depending on how you want the system to behave. 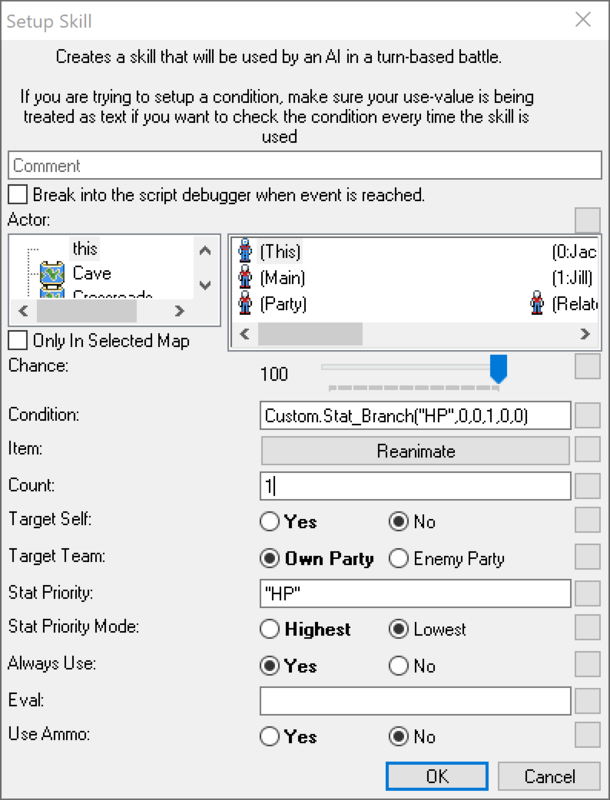 This allows for very complicated skill setups which can attach cutscenes or other actions, as well as complicated conditional requirements, but can also easily lead to user error. The system can run the inputted use-value as a text script, allowing conditions to be checked each time the AI tries to use it (Rather than only checking the condition when the AI setup event is ran) as long as the parameter is in text mode, not use-value mode. An example is the following condition, note how the background of the use-value box is white indicating the engine is treating this input as text, not as a use-value. 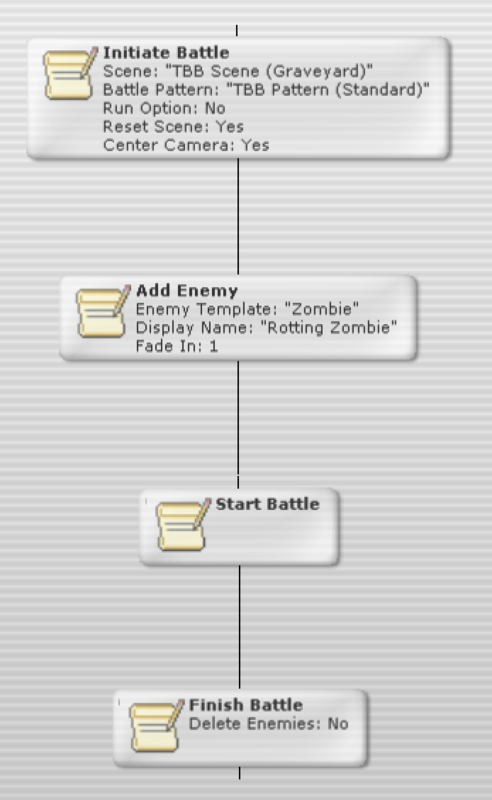 Next you must use the “Setup Ally” or “Setup Enemy” events to add them to the random battle. 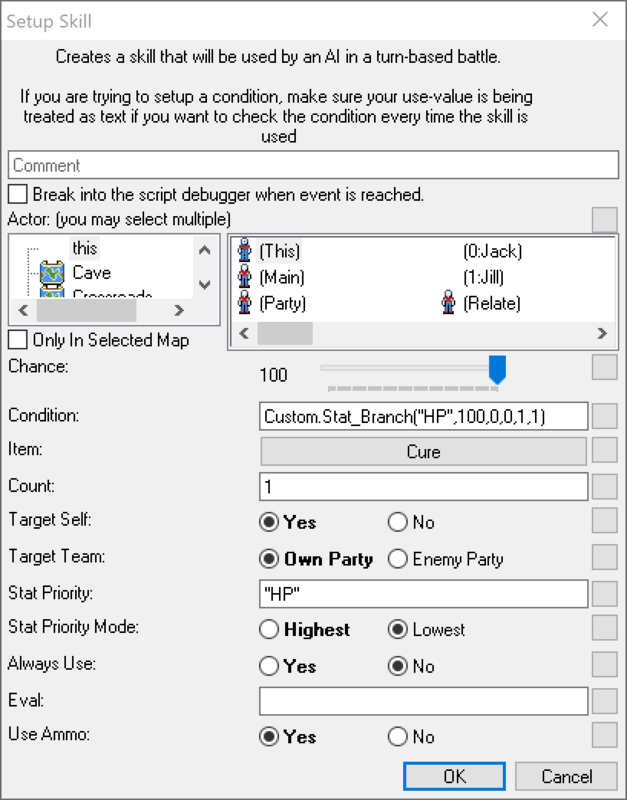 This process is identical to using the “Add Ally” and “Add Enemy” events used in normal turn-based battles, however you must now also specify a Map and Battle ID. Do note that you can not modify these actors AI using the events from the “Turn Based Battles\Setup AI” section so it is recommended to add the AI using a “Loaded” trigger inside the actors template. These events should not be normally placed in scripting unless you are either modifying damage scripts or how the status effects work. If you are creating a new TYPE of status effect, or modifying an existing one, you will need to modify these events to include your new type. Please read the documentation related to creating a new status effect trigger to learn more. There are various options which can be changed by manipulating either global variables, actor variables or interface variables. Here is an overview of the variable options available. Anything that is prefixed with “TBB_” in the variable name belongs to the turn-based system.